Fill out our simple form and get quotes from local food vans. The popularity of street food vans and the delicious food they produce makes catering vans an attractive choice for events and gatherings. 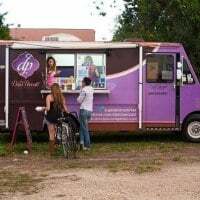 Offering an array of all-time favourite foods as well as some more unusual and gourmet dishes, choosing a mobile food van for your event gives you some appetising options. For food van hire in your area browse below or request quotes. Signature Gourmet Catering provides delicious food for many types of event. We are a pizza catering company providing delicious freshly prepared 10-inch Neapolitan pizzas cooked in a wood-fired oven, from our vintage horsebox. RB's Pizzas "The Classic Pizza Van Man"
Venue: where will it be served? Include specifics about accessibility, water and power supply. Sides - what sort of sides would you like? Some mobile caterers may have a lower price for any children's meals. If there will be no children, please leave blank. Please note hire charges may apply, even if guests are paying themselves. When considering how much you would like to spend per head, please note low guest numbers may mean higher prices per head. Most street food vendors will have an option in this price bracket. At the lower end of this bracket you may have more basic food or smaller portions. This should attract high quality street food options from a wide array of caterers. 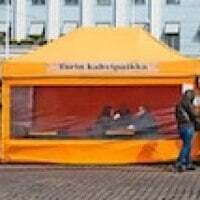 Providing you have sufficient numbers this budget will attract the more popular, higher end street food caterers. Multiple servings/sides per person and will likely include a higher level of service (e.g. staffing, serving style). Popular for Corporate events. Dishes at this price tend to be smaller or more basic. Majority of caterers don't provide options below £5 so fewer quotes may be received. Killins Kitchen offer West Country food and catering services in Bristol and beyond in their unique food van. All of their meat is obtained from a local family butchers and all fish is obtained from local independent fish merchants, ensuring high quality and personal service. 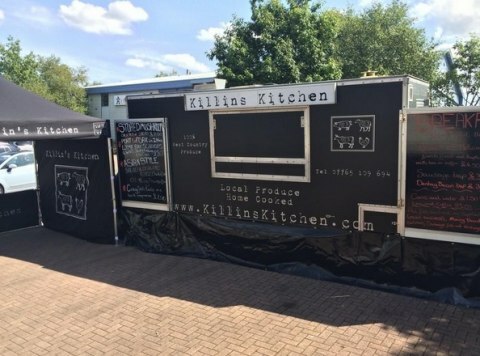 Able to cater for weddings, parties, private or corporate functions and festivals, Killins Kitchen serve their wide range of produce from their specialist food van. To provide an accurate quote, I need to know as much as they do about the event they are organising. Obviously, the date and start time, as well as how long the trade will last and whether there are any obstacles. This could be the location, dietary requirements or lack of power and water. I also need to know how many they want catering for and what they have in mind - burgers or fillet steak! The more they tell me, the more accurate I can be. I would check their reviews and see what other people are saying about their services. Always ask about the produce and their limitations, strengths and weaknesses. This will help you formulate whether the provider is right for you and give you confidence in booking them. I'd also ask if they can offer something slightly different. Even if you don't necessarily want it, it is good to see how accommodating they are to your needs. Killins Kitchen came about when I hit the big 30! I studied hospitality management in Switzerland and worked as a restaurant manager since I graduated in many large companies. Whilst enjoying it, I had this overwhelming urge to have my own business and offer my customers great quality produce at fantastic value. I knew I could offer a better product to the public at a better price so why work hard for someone else when I can work hard for myself. I have my own regular pitch but I rely on Add to Event to gain larger events. I have been with Add to Event for over two years now and I can not recommend them highly enough. At any event that I get talking to other traders I always mention them, as I believe it is a great platform for any business to be a part of. Every event I have done has been successful but one that stands out for me was a glamping site at Glastonbury festival. It was a new venture for the organiser and we were both eager to have a great experience. I would serve 300 people breakfast, from the van, in a space of 2 hours each day and then stay open for lunch and dinner throughout the festival. Everyone enjoyed the food and through Add to Event I now have a great contact and will be back this year with the site being twice the size. Through this platform I have gained many positive events and formed great working relationships. I will always recommend the website as I would be lost without it. 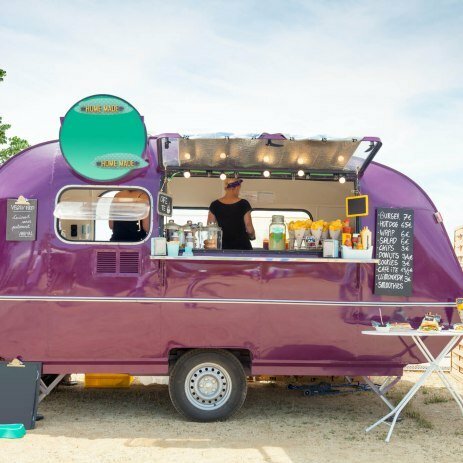 Jacket potatoes, ice creams, burritos, pizza and specialist teas are just some of the intriguing options catering vans can offer your event. 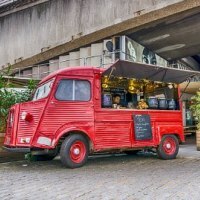 Perhaps you’re organising a market or local event and need a street food van that’s going to draw in a crowd, maybe you’re looking for something unique for your wedding, or perhaps you’re a foodie and want a specialist hot food van at your next event. Whatever your criteria our list of suppliers offer something for everyone. Whichever fast food van or caterer you choose, they will work with you help make your event a success. Browse suppliers for some inspiration or use our quote request form to contact available suppliers in your area.